To coincide with the premiere of Amazon's new streaming series Tom Clancy's Jack Ryan, Paramount Home Entertainment assembles all five films based on the beloved character in one handy package dubbed the Jack Ryan: 5-Film Collection. The first three films are arguably the strongest and preferred, especially those starring Harrison Ford, but the last two admittedly make decently entertaining entries to the Ryanverse. The five films are recruited to 4K Ultra HD as a ten-disc combo pack and each title features a great-looking Dolby Vision presentation and an excellent Dolby TrueHD track, except for Shadow Recruit, which comes with a DTS-HD MA soundtrack. Porting over the same set of supplements as their Blu-ray counterparts, the overall package is Recommended for Jack Ryan fans and UHD enthusiasts. 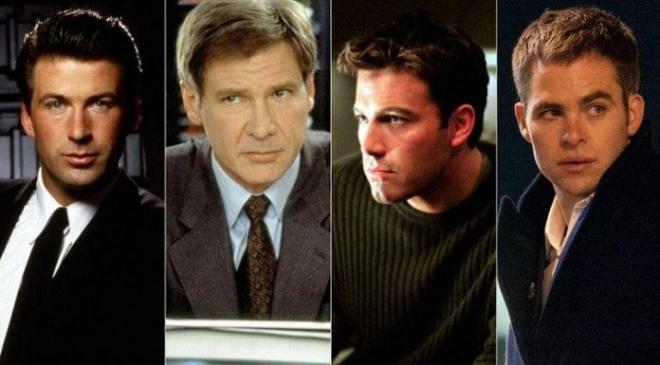 As a fan of smart, cleverly suspenseful espionage thrillers, the Jack Ryan films, each based on the novels by Tom Clancy except for the last installment, have been some of my favorites since John McTiernan's 1990 The Hunt for Red October. McTiernan sails the rough and treacherous seas of a military drama with extraordinary skill and craftsmanship, and over the years, the film has become one of the best combat movies centered around submarines. 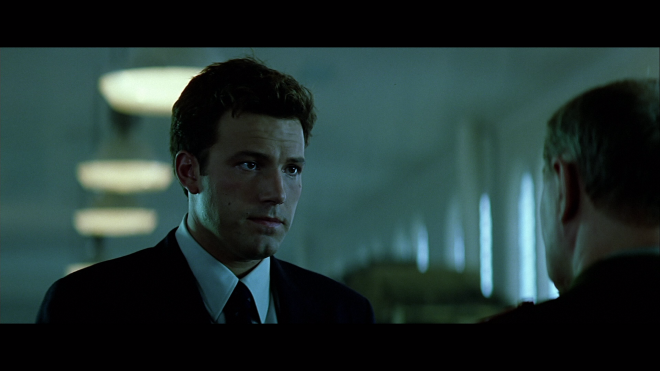 The production will also be remembered for introducing moviegoers to the beloved CIA analyst, a drastically different type of spy who always seems smarter and several steps ahead of those in charge of making urgent, critical decisions. He's a shrewd and highly-intelligent everyman forced into situations that compel him to play the hero, a role he would much rather avoid. Ryan's charm and greatest strength is that he's a plausible ordinary guy with a family while also a true patriot with a willingness to hold his own agency and government accountable. 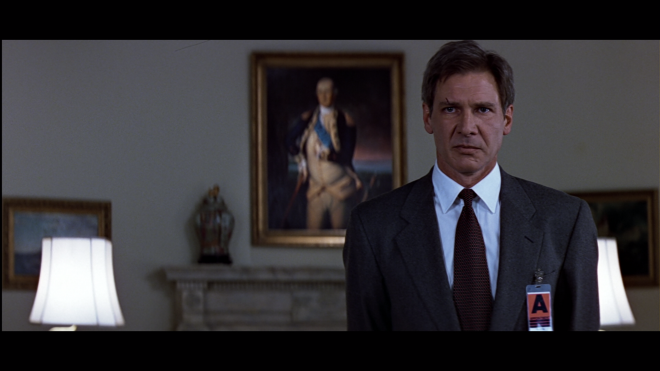 Of course, it's not until Phillip Noyce's Patriot Games that Ryan finally comes into his own, establishing the character as the central protagonist of his own franchise, similar to Clancy's book. Much of this is due to Harrison Ford stepping into the role, which he later reprised in Noyce's Clear and Present Danger, arguably the better of the two. The Noyce-Ford collaborations are excellent films -- espionage thrillers, more grounded in reality and focused on the hours, days, weeks spent on research, deductive guesses and investigative analysis of limited information. It's for this reason that Phil Alden Robinson's The Sum of all Fears and Kenneth Branagh's Jack Ryan: Shadow Recruit feel like somewhat disappointing follow-ups. Both are pseudo-prequel reboots of the loosely-related franchise but don't quite live up to the expectations set forth by the first three films. They're entertaining enough entries that work well as standalone features, but they also favor more action over a game of wits. 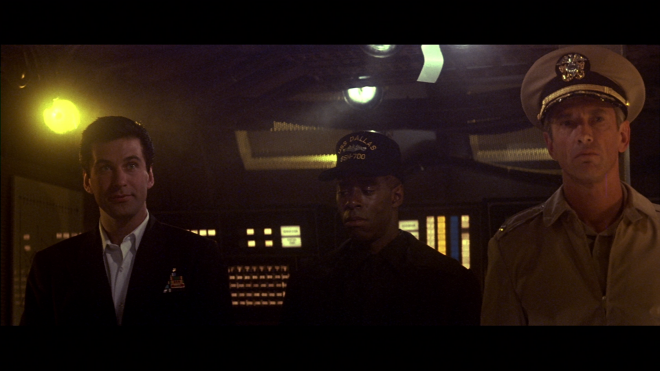 In the end, all the films taken as a whole make for an entertaining series. For a more in-depth take on each movie, you can follow the links to our individual reviews of the 4K Blu-rays. 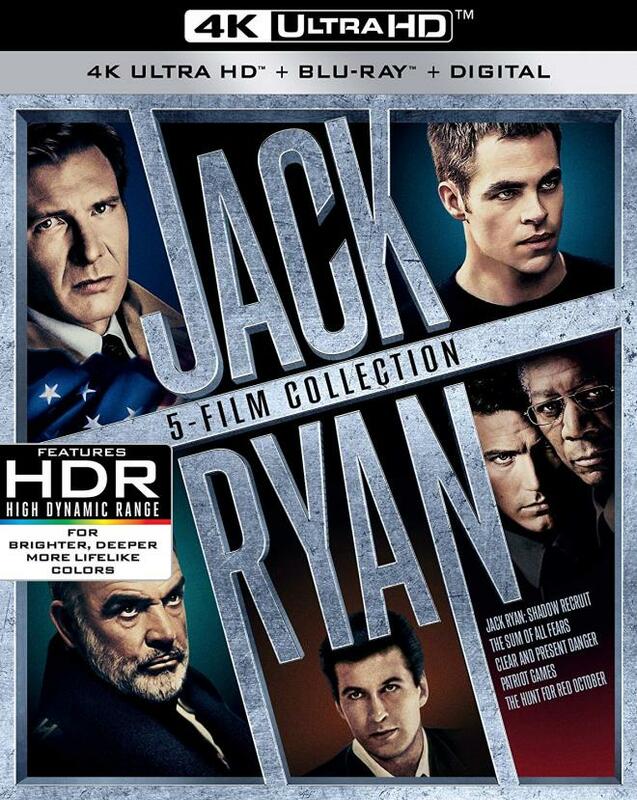 Paramount Home Entertainment brings the Jack Ryan film series to 4K Ultra HD Blu-ray as a ten-disc combo box set dubbed the Jack Ryan: 5-Film Collection. As of this writing, there are no plans for standalone packages. The pack also includes a flyer with Digital Copy codes for each film, which can be redeemed via ParamountMovies.com, allowing owners to watch a 1080p HD copy with Dolby Digital Audio. However, VUDU users can unlock 4K streaming rights with Dolby Vision and Dolby Digital Plus 5.1 audio. Five dual-layered UHD66 discs are accompanied by another five Region-Free BD50 discs spread across three center spindles and on the opposing panels of a thicker-than-normal black, eco-vortex case with glossy slipcover. At startup, viewers are taken directly to a static screen with the usual selection along the bottom and music playing in the background. The score is an accumulative composite of all five films, so for a more in-depth take on each, please follow the links posted above. Nevertheless, taken as a whole, the films have never looked better on home video than they do on Ultra HD, equipped with mostly excellent HEVC H.265 encodes. Each enjoys a welcomed uptick in overall definition and clarity, but Patriot Games is not as sharp as the others while the last two are the most detailed of the collection. In fact, the Noyce films display a heavily stylized cinematography with a greatly toned down contrast, making them look fairly grayish, but the scenes with more exotic scenery deliver a beautiful picture quality. Still, all five are notably brighter with crisper whites and dazzling highlights while black levels show the most improvement throughout, providing the 4K videos with appreciable dimensionality and a lovely cinematic appeal. The Dolby Vision presentation in each also supply the films with a fuller and richer palette overall, showing more vivid primaries and accurately animated secondary hues. The first four films feature the same Dolby TrueHD soundtracks heard on their Blu-ray counterparts while Jack Ryan: Shadow Recruit comes with the same excellent DTS-HD MA track. Although a new object-based audio option would have been a welcomed upgrade, each lossless mix nonetheless delivers an excellent and very satisfying aural experience that nicely matches the visuals. With precise and very well-prioritized dialogue, the soundstage of each film feels broad and welcoming with a great sense of presence and a dynamic mid-range that provides fantastic warmth with great detailing during the loudest segments. The low-end in each may not be particularly standout or memorable, but they're adequate with the occasional room-shaking impact. While most of the attention is placed across the fronts, the surrounds are employed for specific action-packed moments and often provide a satisfyingly immersive soundfield. The design in each also does splendidly well when applying the receiver's Dolby Surround or DTS: Neural:X up-mixing functionality, effortlessly spreading many of the atmospherics and the score all around the listening area and into the overheads.